When the first day of fall came around I cleaned my grocery store out of canned pumpkin. I've been anxiously waiting for this season purely for that reason; pumpkin everything! 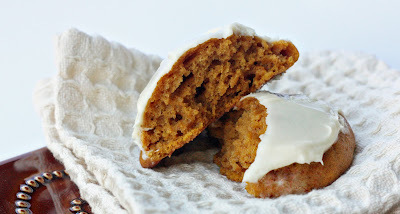 These cookies are the first in a series of pumpkin-inspired recipes that I have been dying to make. 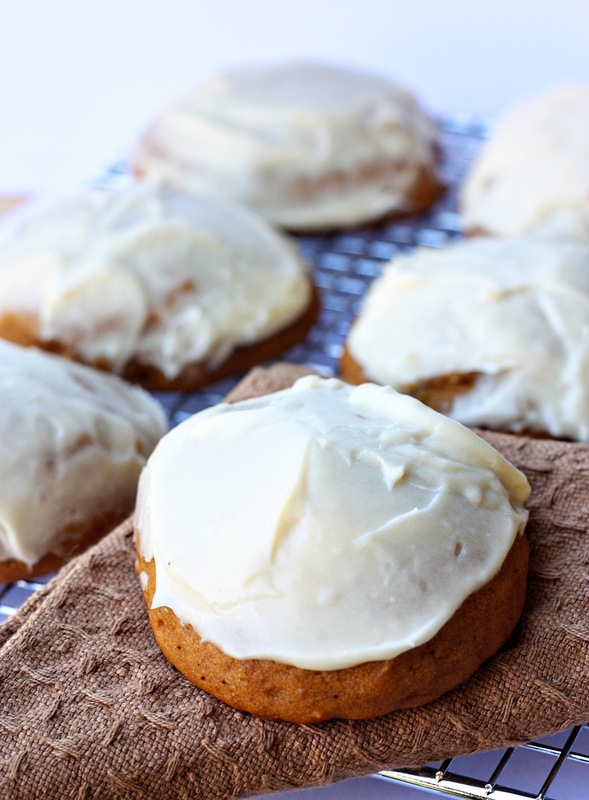 On the "to bake" list this year is pumpkin cheesecake, quick bread, pie and muffins and the first to cross off the list are pumpkin cookies. 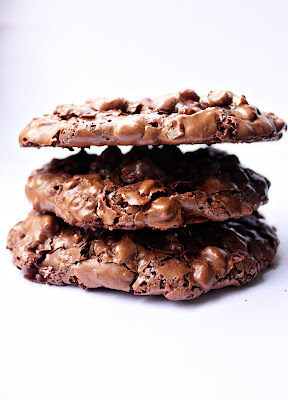 I made these cookies for the first time last year and they are the absolute best! These are a soft and cake-like textured cookie mixed with seasonal spices. 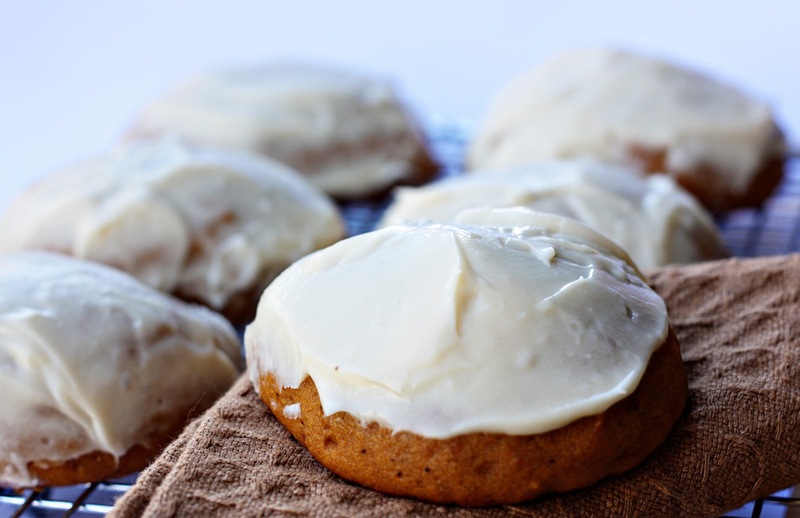 Load the cookies with the cream cheese icing and you'll find it perfectly compliments the earthy pumpkin flavor. Needless to say, these cookies are pumptastic and a perfect way to start start your fall baking. Enjoy! Preheat oven to 325°F and place oven rack in the center of the oven. Line baking sheet with parchment paper. In a large bowl, sift or whisk together the flour, baking powder, baking soda, ground cinnamon, ground ginger, ground cloves, and salt. In the bowl of your electric mixer, or with a hand mixer, beat the eggs and sugar until light and smooth (about 2 minutes). Beat in the oil, vanilla extract, and pumpkin puree. Add the flour mixture and beat just until incorporated. Using 1/4 cup of batter place small mounds of batter onto the prepared baking sheet, spacing about 5 cm apart. Bake for about 15 - 18 minutes or until a toothpick inserted in the center of a cookie comes out clean (I took mine out at 12 minutes). Remove from oven and transfer to a wire rack to cool completely before frosting. Frosting: Beat the cream cheese and butter until soft and creamy. Beat in the confectioners' sugar and vanilla until the frosting is soft and creamy. What do celebrities Courteney Cox, Scott Wolf, Katie Lee, Mario Batali and The Pampered Chef have in common? 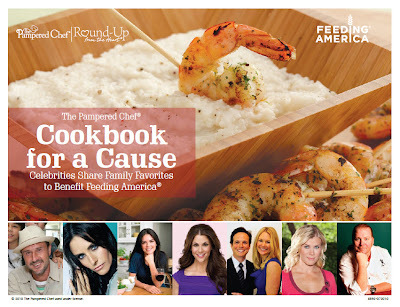 A celebrity cookbook that is part of The Pampered Chef’s Round-Up from the Heart campaign to help feed the hungry. Until September 30, visit The Pampered Chef and download the FREE celebrity cookbook. For every cookbook downloaded The Pampered Chef will donate a meal (up to 140,000) to Feeding America. This year, The Pampered Chef’s goal is to donate 10 million pounds of food. By downloading this exclusive cookbook, you play a big part in reaching that goal! Click here to download the cookbook, cook like a red carpet star and know that you’re supporting to help end hunger. Goodness me! I think my body is going into pre-hibernation mode and going on an only crave and eat carbs diet. Oh dear. Lucky for me (but unfortunate for my waist line) these cookies fall into my new “diet” category. 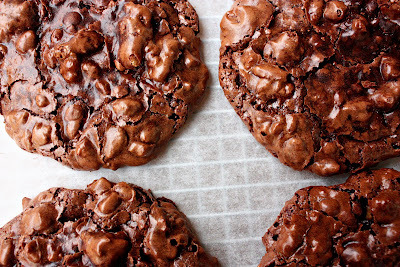 These are best described as collision between soft meringue and a fudgy brownie. They are perfect. I haven’t been able to put them down. Seriously. Absolutely no will power. 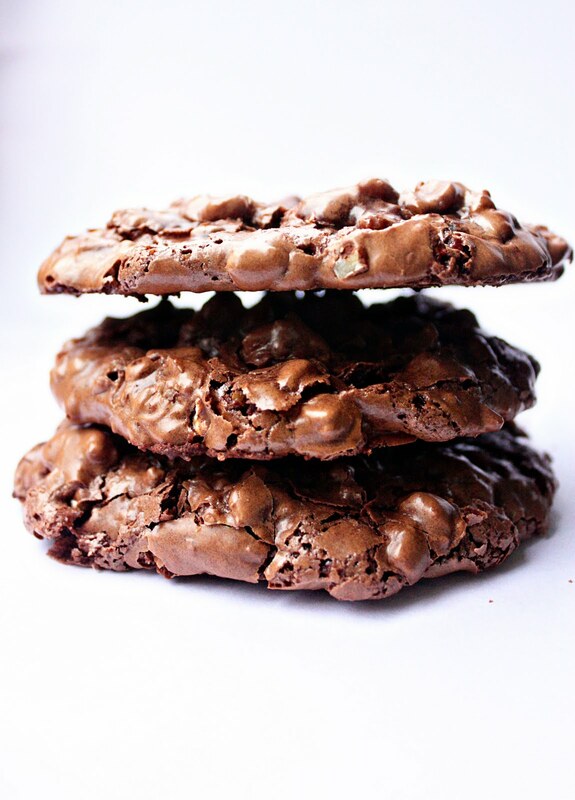 Each bite is chocolate heaven; soft and fudgy with nuts for crunch and bound with egg whites. What’s even better is that they are gluten and dairy free. Now no chocolate lovers have to comprise on chocolaty bliss. There are just six ingredients between you and a batch of these cookies. No mixer necessary, just a big bowl and a wooden spoon. Pour yourself a large glass of milk and enjoy. I’m going to go and look for my Spanks. Toast your pecans, cool them and roughly chop them. In a large bowl, stir together the icing sugar, cocoa and salt. Add the nuts, then stir in the egg whites and vanilla. Stir until well combined. Line a baking sheet with parchment and spoon the batter, about 2 tablespoons each, in mounds allowing for plenty of room between cookies. These cookies really expand! Don't try to get more than 6 cookies on each sheet and try to avoid placing the batter too close to the edge of the pan. Bake for 10 -13 minutes. They will spread, puff, crack on top, get glossy and then turn matte. Slide the cookies on the parchment off the sheet onto a cooling rack and let them cool. Have mercy, these are delicious. 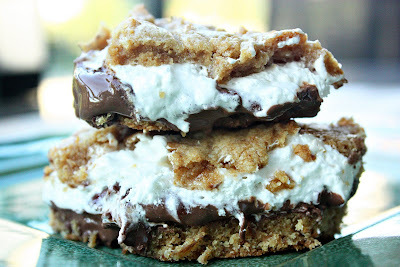 They seriously tasted just like a s’more, and they should, considering that all of the same ingredients are used, just kicked up a notch! But that's exactly why these minions are so irresistible. They are rich and gooey with a layer of chocolate and marshmallow sandwiched between a graham cracker cookie crust. 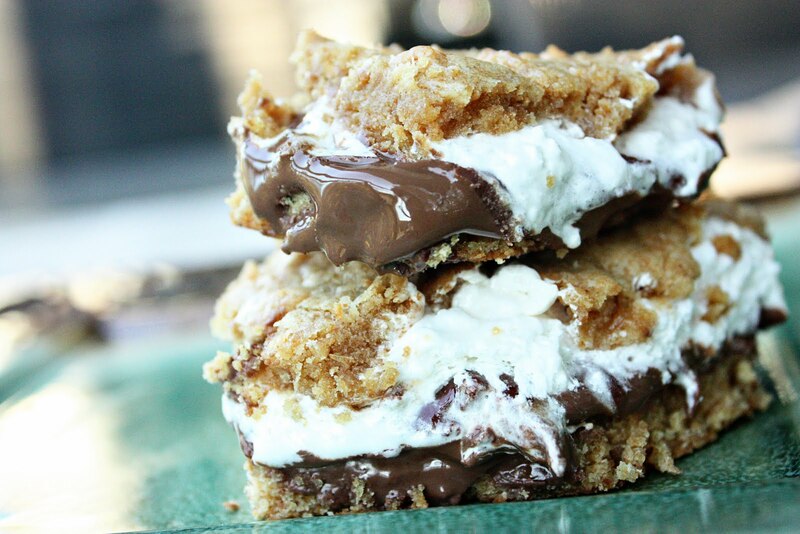 If you really need further prompting, think back to your very first s'more. Now multiply it's size and taste by 100 and imagine it in the form of a soft, cookie bar with a little bit of salt added into the tender graham cracker. 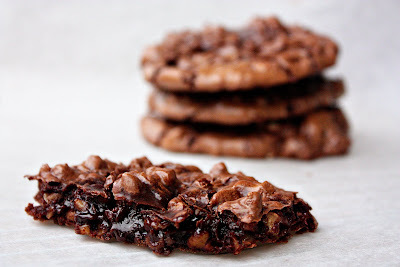 Please, don't hold me responsible for any stomach aches or extra mileage added to your daily run as a result of this recipe but do know that each bite is worth every calorie. In a large bowl, cream together butter and sugar until light. Beat in egg and vanilla. In a small bowl, whisk together flour, graham cracker crumbs, baking powder and salt. Add to butter mixture and mix at a low speed until combined. Divide dough in half and press half of dough into an even layer on the bottom of the prepared pan. Place chocolate bars over dough. 2 king-sized Hershey’s bars should fit perfectly side by side, but break the chocolate (if necessary) to get it to fit in a single layer no more than 1/4 inch thick. Spread chocolate with marshmallow creme or fluff. Place remaining dough in a single layer on top of the fluff (most easily achieved by flattening the dough into small shingles and laying them together). Spread it around gently. Bake for 30 to 35 minutes (I took mine out at 27 minutes), until lightly browned. Cool completely before cutting into bars.